I've been thinking on whether to write something about the Olympics, as it's held here in Canada, and it is one of the main events this year (or month). This is also a part of history that would be read and learned by students every year as well (By the way, I congratulate all the winners in the competitions, most especially the Canadian athletes.). But then again, I wanted to remind myself that in February 1986, Filipinos gathered at one place to free themselves from the terror of the late and former President Marcos. It's a shame that I haven't been born when this event took place. I could only savor the feelings through books, videos and stories of my parents and the elders who were a part of this revolution. Being the dictator and the former President of the Philippines for twenty years, Ferdinand Marcos ruled the people and kept them in fear through arrests and assasinations one after the other. Those were very dark times. The citizens had no choice but to follow orders for their family and themselves can disappear all at once. Marcos controlled the country just like how a master controls his puppet. For his first term in 1965 though, he was able to establish the Philippines as one of the richest countries in South East Asia. Unfortunately, power prevailed in him when he tried to run for the third term, thus declaring Martial Law in September 21, 1972. However, when Senator Benigno Aquino Jr. went back to the Philippines in August 21, 1983 after a three-year exile in the US, he was assasinated after stepping out of the airplane. Aquino was the only person brave enough to fight back that caused his imprisonment and banishment from the his beloved country, so his death was a huge impact to the people, losing more of their faith on the Marcos administration. Snap elections were held in early February 1986 to see if Marcos still has his 'loyalists' who support his regime. One result had him winning against Corazon Aquino, Ninoy's wife, while the other result favored the latter. 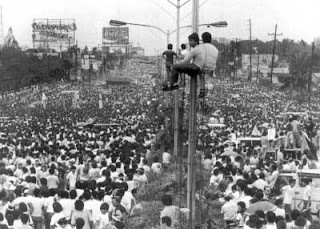 People were appalled; and in the 22nd a resistance started where hundreds of thousands of Filipinos from all walks of life gathered at EDSA (Epifanio Delos Santos Avenue), protecting the military officers who rebelled against the government. Masses and prayer vigils were held everyday. Unarmed civilians kept coming in, supporting this massive revolution that would hopefully oust the dictator. There was no trace of any violence except for a soldier that was accidentally killed due to a discharged gun. Hours turned into days. 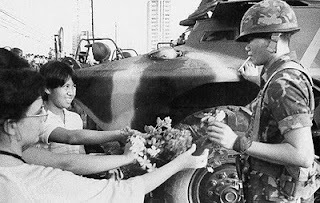 Young women handing out flowers to the soldiers in tanks as they were about to pass through them. People flashing the "L" sign using their thumb and index finger (L means laban or fight in english). And then, at the night of February 25, a miracle occurred. The first family and his allies left for Hawaii. Earlier that morning, two inaugurations for Aquino and Marcos were held. A nationwide celebration was about to happen. Twenty-four years sure feels long, but for those who were a part of it, it is definitely a memory worth reliving for. The Filipinos are worth dying for. I hope everyone would make a wise decision this coming election in May.